Recently, I've been scouring op shops and council clean ups for some old items. Yep. Seriously. I'm slowly getting addicted to vintage items and props and food photography and styling. Although I've had this blog for awhile, I've never really taken any real effort to style and prop and focus on the photographs until fairly recently (and but that I mean about a year now). I've bought books on food styling, taken workshops on food photography and admired magazines and other blogs but have never really taken a keen interest into these things until now. Why now? Not really sure? I guess the exposure to so many media outlets can get one really inspired and into it. From Instagram alone, the creativity is just endless and photography always stunning. I follow a few bloggers and food photographers and always, always get mesmerized. Food is amazing. And food photographers (and stylists) are the magicians! And so in my own little world (my blog) I replicate these creative geniuses - I style and prop and capture my own food creations. And I'm learning. Now back to this simple apple pie. This was originally my post for the June SABH but the tropical blood in me shone through and a buko (coconut) pie just had to be. But we've made these several times now and each time it just comes out perfect. 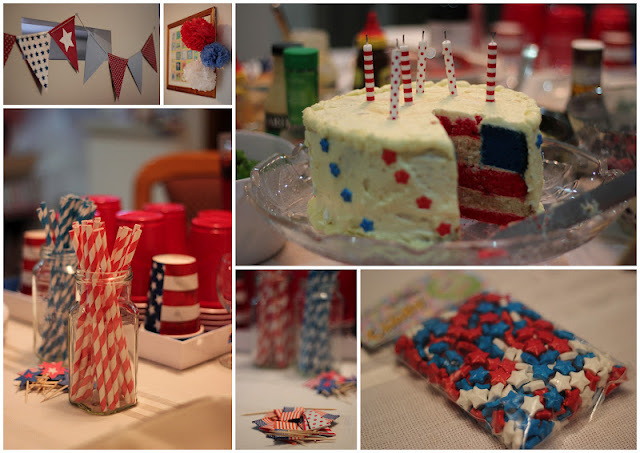 For weekend afternoon, for work and recently, for a 4th-of-July themed birthday tea. It is a simple recipe as you don't have to pre-cook the apples for the filling. All you need is a good basic recipe for pate sucre (sweet paste) and bake you go! To make this apple pie, recipes were adapted from a 2 sources. I've used the pastry recipe learned from last term's module at Ryde TAFE - Pastry, Yeast and Baked Goods. The filling from Flo Braker's flag-raising-apple-pie from the recipe book The Simple Art of Perfect Baking. You will need a rolling pin and a clean counter top to prepare the crust and topping. In a small bowl, lightly whisk the egg with the vanilla. Set aside. In a large bowl using your hands, rub the flour and butter together until it resembles fine crumbs (may take a few minutes). The butter does not have to be at room temperature but it works best when they are cut into cubes. Add the caster sugar and zest and work lightly. Add the egg and vanilla mixture and work quickly using you form a soft dough. Wrap in plastic cling and refrigerate for 30 minutes. Prepare your pie plate/pan/tin by spraying with oil or coating with butter. Once the pastry has rested, cut half and set aside. Prepare a cup of flour for dusting the counter and working with the dough. Splash some flour onto the counter and some on your rolling pin before working with the pastry. Work with the first half of the pastry on a clean counter and using a rolling pin, roll the pastry until you get about 3-4mm thin (thicker if desired as long as you have enough to cover the base of your pie pan/tin). Using the rolling pin, lift the pastry onto your prepare pie pan/tin. Press gently onto the bottom and sides of the pan. Trim excess and combine with the other half of the pastry. Pour the apple filling onto your pastry and set aside. Work with the second half of the pastry with a rolling pin, same way with the crust - working with a bit of flour on the counter top. Roll until you get 3-4mm thin (or your desired thickness). Lift this with the rolling pin and place on top of your pie. Gently press the pasty onto the filling. Trim the sides and pinch or indent with a fork. Decorate your pie with the leaves/shapes and prick parts of the pie with a fork. Brush the top with some egg wash (a combination of 1 egg lightly whisk with a tablespoon of water). The egg wash creates that shiny glossy finish when the pie is baked. Bake at 180*C for 45 minutes or until golden. Useful tip - when working with the pastry, I usually spread the cling wrap/film on the counter (which was used to wrap the pastry) to avoid sticking on the counter. You can do this too or just sprinkle some flour on the bench. In a small bowl, mix the sugars, flour and spices. Peel, core and slice the apples thinly. Pour into a large mixing bowl. Sprinkle the dry ingredients (flour, sugar & spices) and toss gently using a spatula. Drizzle the lemon juice and melted butter and toss to coat the apples and combine. 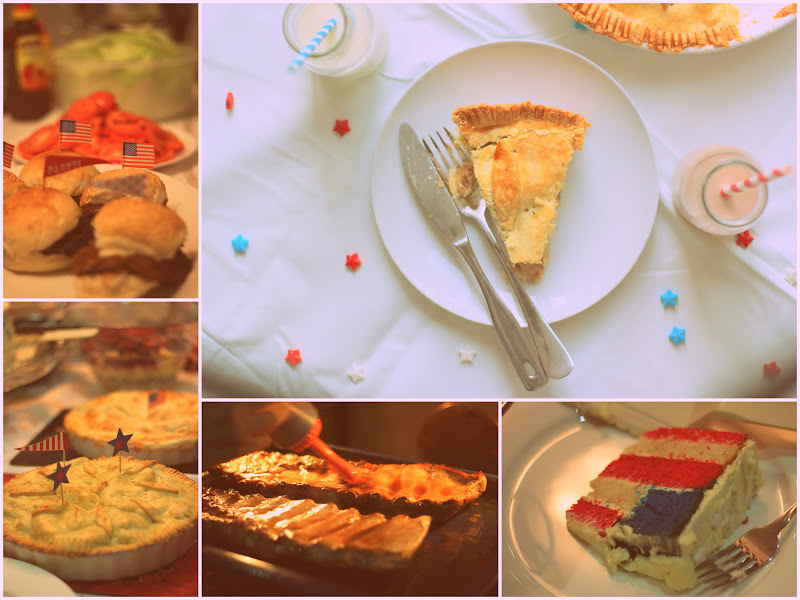 Flo Braker's flag-raising-apple-pie included a base pie crust and a streusel topping, which I've opted not to use. This is a simple apple pie recipe. A pie crust that tastes just like shortbread and an apple filling that smells so good with just the right hint of cinnamon and nutmeg. Everyone who's tasted this asked for the recipe. Served with whipped cream or vanilla ice cream. A truly simple and filling treat. Go ahead and make it! I hope you'll enjoy it as much as we did. PS - that cake in the photo with the red, white and blue layers? I did not make that. A friend of mine created that 4th-of-July themed cake for her son's birthday. Awesome isn't it! The red, white and blue pom poms we made inspired Martha Stewart DIY crafts. I'm also enjoying styling the food that I make, but unfortunately I don't know much about photography. I do the best I can with a point and shoot camera. It's not easy to get a good shot like your pie on top that goes from being in focus to being out of focus. We missed you this week. Hope to see you next week for the power foods.